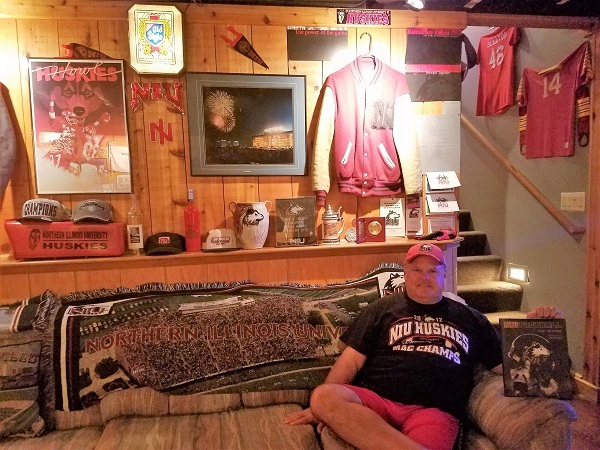 Since coming to Northern Illinois University in the early 1980s, Dave LaCerra has collected all things symbolizing his alma mater and has enshrined them in his basement, especially football memorabilia. His collection has evolved since his time as a walk-on NIU football player in 1982. His shrine-like area is known as Dudeland since LaCerra is affectionately called “The Dude” by his friends and former teammates. During college, he won the Delta Phi Epsilon’s Deepher Dudes fundraising contest, an annual male beauty pageant, and the nickname stuck. One of his favorite memories of NIU is his participation in the 1983 California Bowl, which led to induction into the NIU Athletics Hall of Fame as a team member. His certificate from the 1995 induction, along with California Bowl shirts, pennants and posters, are displayed on the walls of his basement. Among his other treasures are a football signed by former NIU coach Jerry Kill, remnants of the goalposts that were torn down after the win against The University of Toledo in 1983 and his NIU football trophy for Scout Team Player of the Year. Other artifacts remind him of his NIU friends, who have contributed to his collection. The loyal NIU football fan proudly displays a license plate that reads “HUSKIE 1” from teammate Dan Feely, a football golf outing photo with Cindy Morgan, his Phi Kappa Sigma Fraternity Little Sister (the actress who played Lacey Underall in “Caddyshack”), a goalpost crossbar from teammate Kent Iwema and NIU pottery from former Huskie Athletics Director Cary Groth. 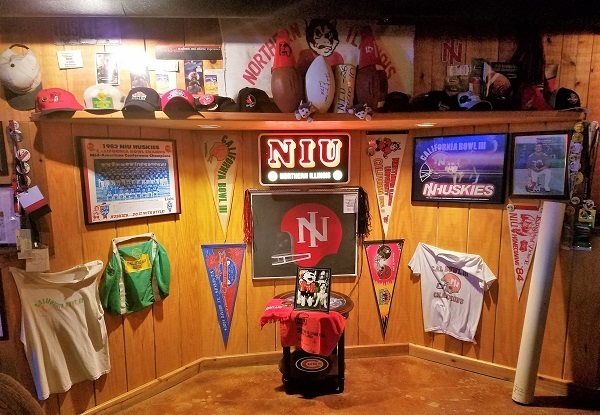 Whil e NIU photos, hats, shirts and awards dominate the room, LaCerra also uses the room to show his support for the Bears and the Cubs and has turned the basement into an entertainment center with a bar and a viewing area with four televisions. His loyalty stems in part from getting a great education, receiving a full football scholarship and meeting lifelong friends, the Mount Prospect resident said. When he was a computer science major, LaCerra secured a job several months before graduating in 1986. “NIU’s computer science program was geared for immediate employment and prepared me to have a good job right out of school,” he said. Since then, LaCerra has repeatedly given back to his alma mater. As a volunteer, he has been active in the Varsity Club and has served on the NIU Alumni Association Board of Directors, the NIU Athletic Board and the Huskie Fan Advisory Board. As a philanthropist, he has made donations through the Red and Black gala and the Victor E. Ball and has purchased commemorative bricks. Through the brick program, he has honored his late father, an NIU alumnus who encouraged him to enroll at the university. His father was always there in the stands at Huskie Stadium during his football games and took him and teammates out to dinner. He and wife Sherry consider NIU one of their clubs and attend alumni and athletic events regularly to engage with fellow Huskies who are passionate about the university. He has incorporated NIU into his life in many ways, including his wedding. The “Huskie Fight Song” played when the couple became husband and wife, they burst through a paper hoop as part of the football theme and a Huskie jersey hung at the head table. Joe Novak, his defensive coordinator in 1982 and 1983 and NIU’s head football coach at the time, attended the wedding. He emphasizes that he is no exception to the Huskie fan base and loyal supporters. He has met fans who haven’t missed a football game in years and others who have season tickets for all Huskie sports.